Spacious tents set on the banks of Weboro Lagoon offer panoramic views from their private decks. Long winding boardwalks between the main area and the tents offer privacy, and the opportunity for guests to stretch their legs. 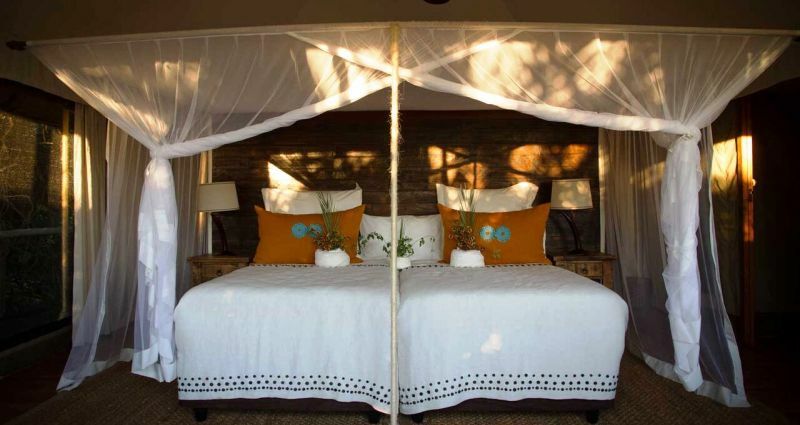 The tents are light and airy and have en-suite bathrooms with large rain showers. The bathrooms are adjoined to the rooms by a short corridor, making the most of the view over the lagoon. Mopiri means ‘Little Island’ in the local Bayei language. The camp is surrounded by crystal clear Delta water on all sides. The camp sits on a three-kilometre lagoon perfect for leisurely sunset cruises. Seven spacious en-suite tents are set on the banks of Weboro Lagoon offering panoramic views. Long winding board walks between the main area and the tents offer guests privacy and the opportunity to stretch their legs and explore the island. The tents are light and airy and have seperate bathrooms with large rain showers, twin sinks and WC. The bathrooms are adjoined to the rooms by a short corridor making the most of the view over the lagoon. Three family units and seven luxury rooms. Family rooms are located on a different island, offering privacy and a private swimming pool area. The main area has a large dining room, with a separate lounge area. There is a substantial deck overlooking the lagoon with hidden seating areas and a fire pit, perfect for stargazing. The swimming pool is positioned with views over the flood plain. The boma, in the middle of the island, is where traditional evenings are held and guests can enjoy the sounds of the Mopiri choir and taste local cuisine. Meals are served in a variety of al fresco locations around the islands and camp. With one of the owners being a renowned chef, Mopiri offers guests a unique dining experience, with the option of local delicacies when available. • Bush Walks (there are a number of islands close to camp which are ideal for short walks). • Fishing Trips (Bream, Tiger Fish, African Pike, Barbel). Keen fisherman are advised to bring their own kit, however basic gear will be available at the camp. • Day Boat Trips to the islands with a bush walk and mokoro trip. (Meals can be set up on the islands so that guests can leave camp early in the morning and return just before dark). • Overnight Trips to private fly camps (incorporating boat trips, bush walks, Mokoro trips, cultural tours and fishing). • Bird walks by The Wild Bird Trust and the chance to discuss their research. • Trans-Okavango Trips from Mopiri to Maun (on request and seasonal). • Sundowners and private dinners can be enjoyed aboard the double storey barge under the African night sky. Accommodation Rates:- From $495 per person sharing. Please contact us for a quote and suggested itinerary.